“Our boats are affordable, dependable and extremely easy to buy and own. Our brand new 285 Cruiser (is) a dependable, affordable and deceivingly spacious home away from home,” to quote Bayliner Boats President, Jeff Behan. And deceivingly spacious is a most apt description of this newest Cruiser offering from this, tradionally one of the largest manufacturers of family pleasure boats in the world. 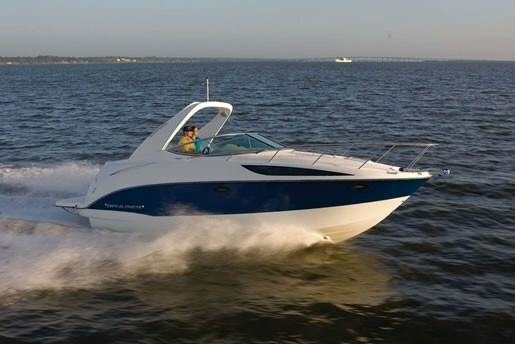 The 285 is one of six Bayliner Cruiser models for 2011 ranging from 24 to 34-feet. Bayliner also offers thirteen other models of Bowriders, Ski N Fish, Cuddies, and Deck Boats starting at sixteen feet. There are two major design contributors to the voluminous space aboard the 285. One is its beam – almost ten feet of it – nine feet, eleven inches to be precise. When you spread those extra inches of beam throughout the length and depth of a boat this size, the extra cubic volume it creates becomes very noticeable in extra shoulder room, storage space, isle width, berth size, etc. It just feels more roomy and less confined. The second contributor to real and perceived space on board is Bayliner’s “beam-forward” design which continues the widest part of the boat up toward the bow which also helps create a broader, more inviting foredeck for lounging. The new 285 is said to have the widest beam of any single-engine cruiser available. Inside the cabin of this mid-cabin express cruiser, the feeling of roominess is further enhanced by ample headroom plus the use of several and large windows and ports allowing natural light inside and more opportunities to see outside. Hullside windows run the full length of each side of the salon/galley area, two opening, screened ports supply fresh air and light to the forward “V-berth” area, and a large overhead opening hatch provides the same benefits there. Bayliner is quick to promote the storage capabilities of its galley with both upper and lower cabinets, and a full complement of available amenities including microwave, refrigerator, single-burner, glass-top electric stove, and sink with faucet. Cabin entertainment is provided by an MP3- ready AM/FM/CD stereo with an optional 19-inch flatscreen TV/DVD. The convertible dinette opposite the galley with storage below will honestly seat four adults or alternatively, sleep two. The forward berth is refreshingly rectangular in shape along the forward port side and has storage below. A curtain supplies visual privacy to this area. 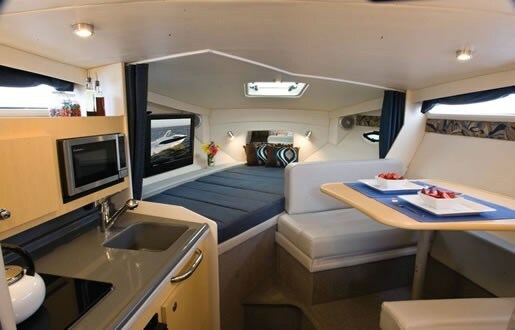 The molded fibreglass stand-up head on the starboard side aft of the dinette provides a vanity with sink and faucet, hot and cold pressure water, toilet, shower, a storage cabinet, and an opening, screened port. Perhaps the jewel of the 285 Cruiser’s interior is not only the size of the mid-berth but also its full-height closable door, not curtain, for the ultimate in privacy in a boat this size. A hanging locker is within easy reach. The extra beam of the 285 Cruiser really shows in the layout and spaciousness of the cockpit. Seating is maximized with an adjustable, doublewide helm seat with flip-up bolster for the captain, a portside lounge seat with storage below, an aft-facing starboard side lounge, plus a transom bench seat. Between these latter two, opt for the huge cockpit table to feed or entertain all of your guests out here, or convert the whole area into a huge sun lounge with the optional filler cushions. Go for the cockpit refrigerator and huge extended swim platform and your partying, fun and entertainment capabilities are endless. A colour-matched bimini top is standard, and for our Canadian climes, opt for the front, side, and aft curtains to fully enclose the cockpit. To maximize your extended cruising comforts, you could choose air conditioning/heating, a bow thruster, foredeck cushions with rails, transom shower, Garmin™ navigation package, 3 kW generator, remote spotlight, VacuFlush® head, and/or a remote controlled anchor windlass. Standard power on the 285 Cruiser is a single 300 hp MerCruiser 300 M MPI (350 Mag) with Bravo III outdrive. You can go to the 380 hp 8.2L MerCruiser if you need speed or carry lots of weight, or, for long range cruising, you could choose the 4.2L MerCruiser Diesel option. Once again, as has often been the case over the years, Bayliner has produced a very spacious and affordable way to take the whole family boating with all of the basic necessities supplied to make a family outing on the water both fun and enjoyable, and yet it offers a full complement of accessories and options that you can choose as you wish in order to personalize to your own tastes and desires.